The Prime Minister Youth Programme (PMYP) is going to launch ‘Startup Pakistan Program’ in the next few months. 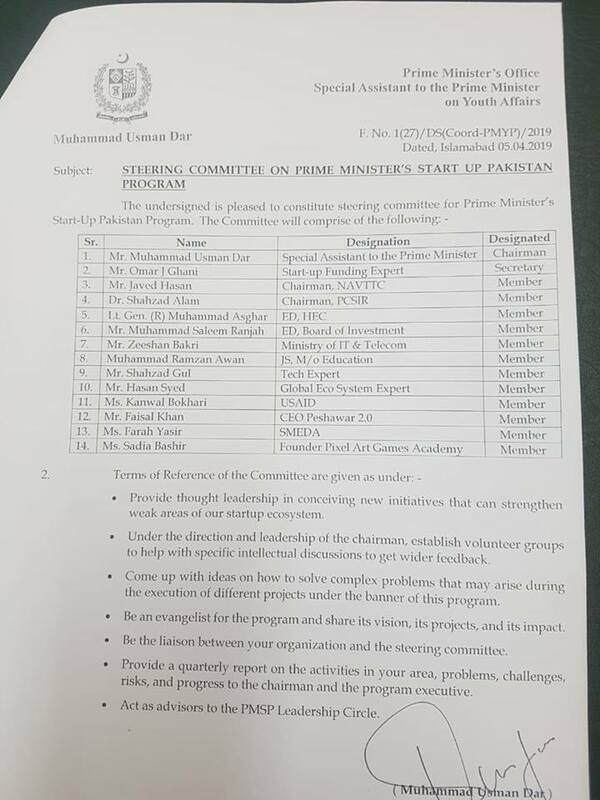 PMYP has just confirmed steering committee members of the program. According to a notification issued by the Prime Minister’s office, Special Assistant to the PM on Youth Affairs, Muhammad Usman Dar has been appointed as the Chairman of Startup Pakistan Program. He will lead a team of 13 members including one secretary — Omar J Ghani, who is a startup funding expert. Previously, an official familiar with the development had affirmed that the startup program will also establish Technical & Vocational Education and Training (TVET) institutes in the country to develop innovation-driven entrepreneurs (IDEs). Other than chairman and secretary, there are 12 more members of Startup Pakistan steering committee including three women.